Before that, however, there was the issue of the weather forecast. Saturday was awash with severe gale warnings over the whole country and it looked sensible to stay indoors. However, we’re not sensible. 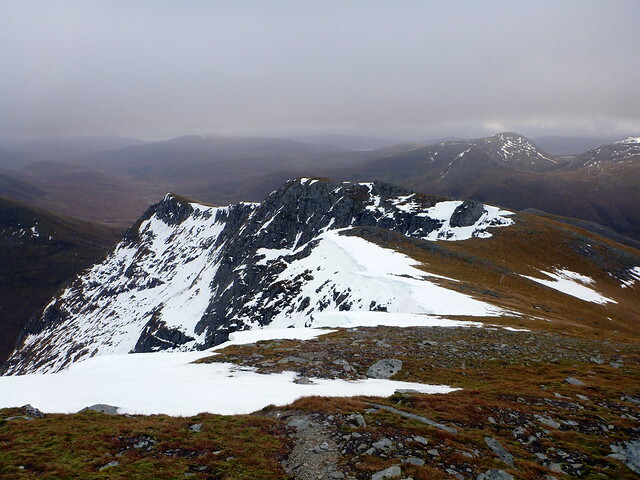 An opportunity for Allison to play catch-up with some hills I’d already done was available, and I thought that Beinn Challuim might be worth a punt – should have a bit of shelter from the west wind from the hills of Orchy and has nothing too scary to get blown off either. I’d done Challuim last December, in miserable weather and had hoped for some views on any re-ascent – but we were not going to get these today. 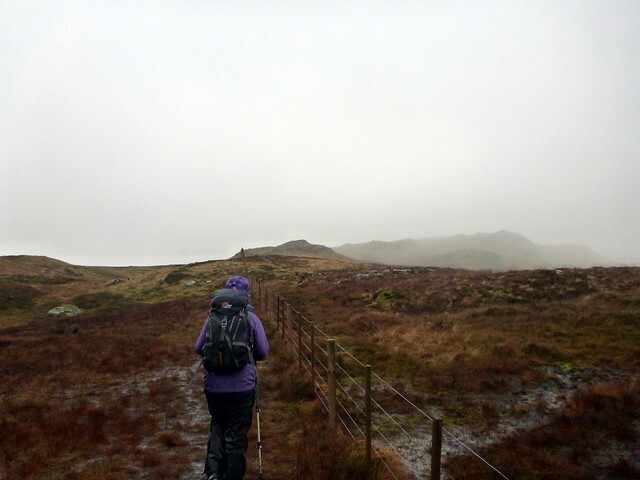 Waterproofs on at the start of the walk, up past Kirkton farm and the wee cemetery then splodging through bog and bracken. Challuim is a fairly gradual and steady ascent, and at first the wind didn’t seem to be too strong. 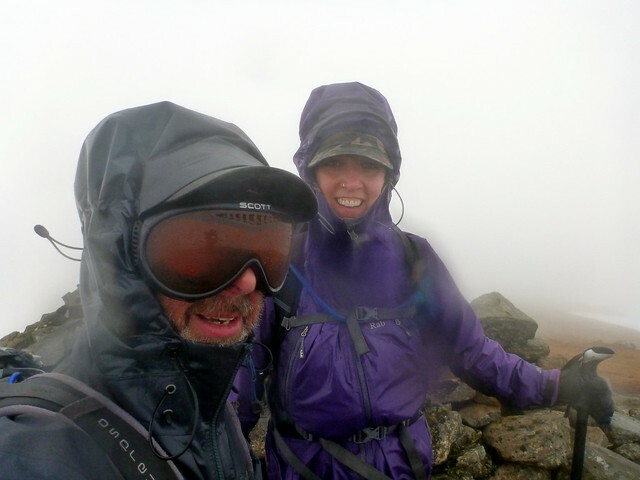 As we reached the 850m mark however, the full force of the gale was unleashed. 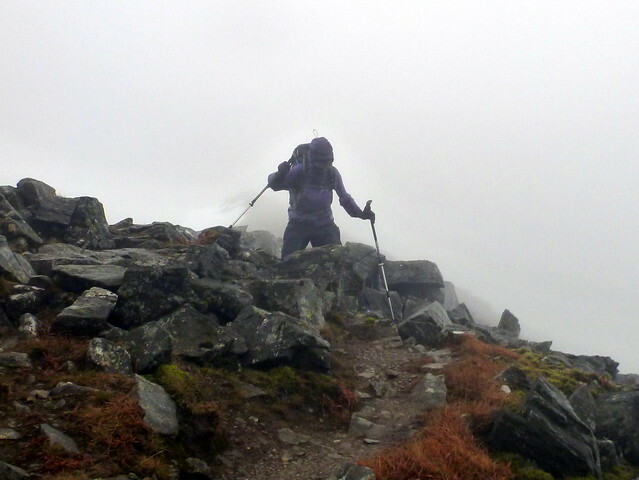 We met a woman coming down who’d baled out at this point, but – being us – we pressed on. At times I was brought to a complete standstill, at times Allison was walking forward but travelling backwards “I never knew I could Moonwalk” says she…the zigzags in the path meaning that you were impeded then propelled turn about. 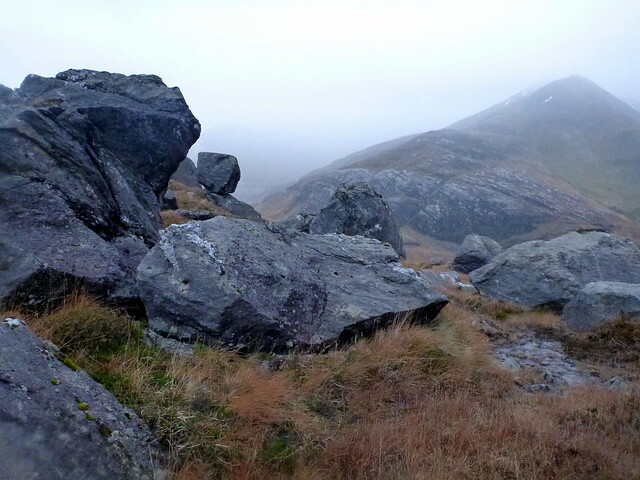 Must be that stone in weight I’ve gained in the last few months keeping me grounded… Up to the cairn at 998m then on to the wee bit of ridge heading for the summit. 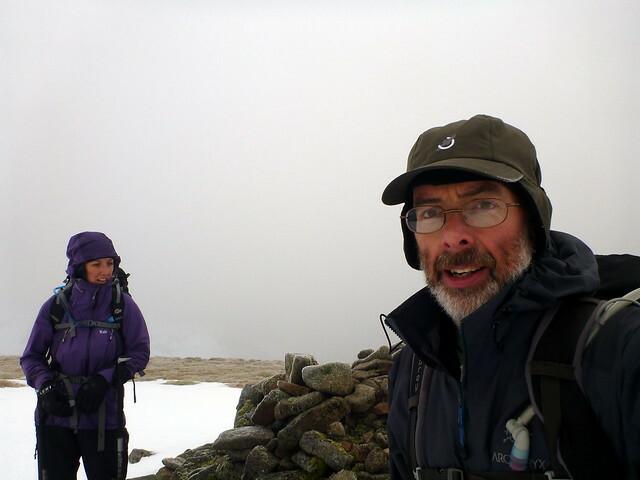 This involved a bit of care, as the gale was blowing crosswise, trying to push us over into Coire Challuim, but we resisted, scrambling over the rocks further down from the crest path and finally attaining the peak. 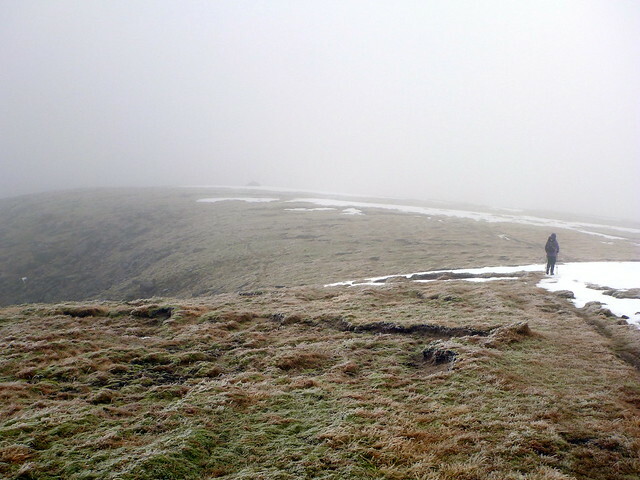 Weirdly it was less windy right at the top and we were able to find enough shelter to have some lunch. No tick for me, but was Allison’s 182 hill, meaning she could start “countdown from 100” mode. 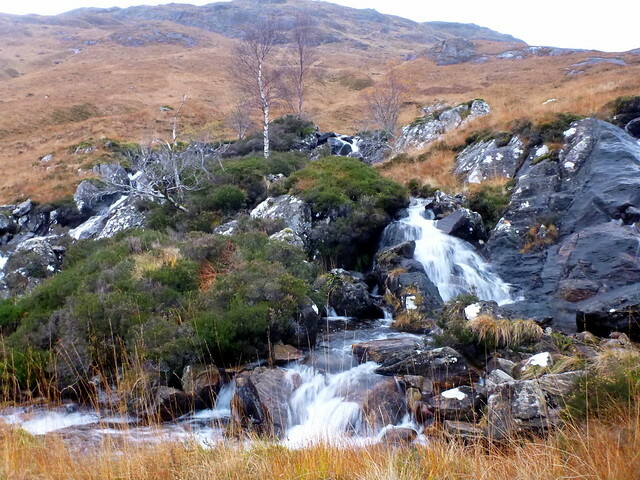 Following the same path back down there were some entertaining pirouettes in the wind and bog – one of which unfortunately twisted the Sick Kid’s dodgy knee. Back at the car, soaked through, with my waterproof trousers failing for the first time to keep my innards dry I was feeling somewhat grouchy. 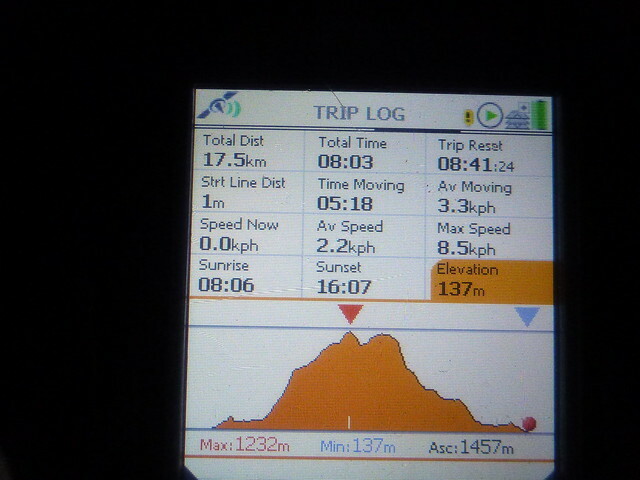 Met 4 guys at the car park who’d given up, also around the 850m mark. Should have kept going, guys! 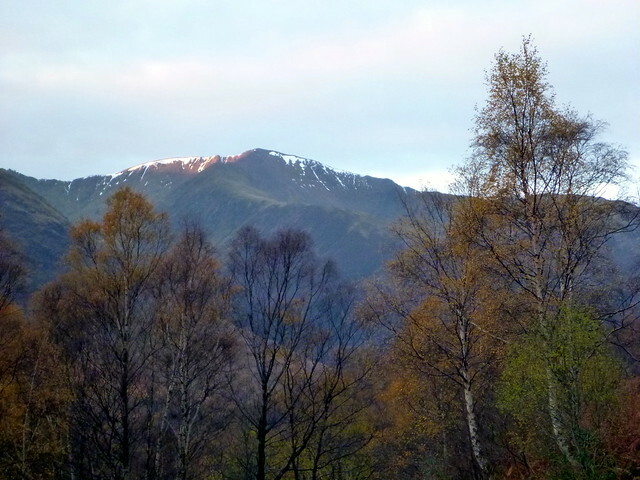 Then it was up to Fort William for stage two. We called into the town centre to get a couple of things – including waterproof tape to effect emergency repairs on Sick Kid’s waterproof trousers, which had developed a 3” gash during our exploits . The main shopping street looked terribly derelict on a wet Saturday afternoon – it seemed there were more shops closed down that places open. Sad. 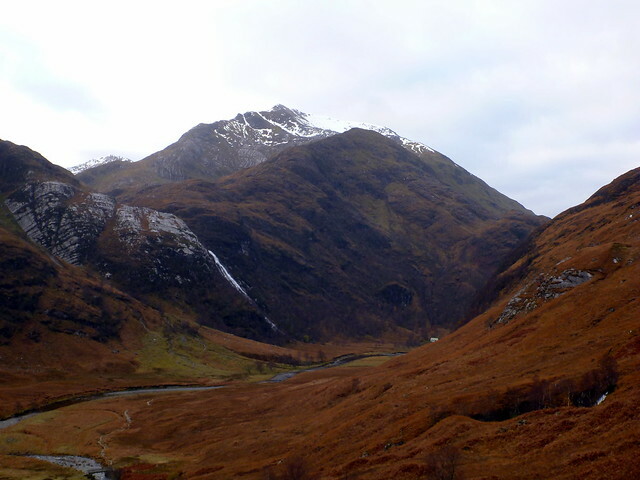 Fortified by a pint in the Grog & Gruel we set off up the Glen Nevis road for Steall Meadows to camp for the night. 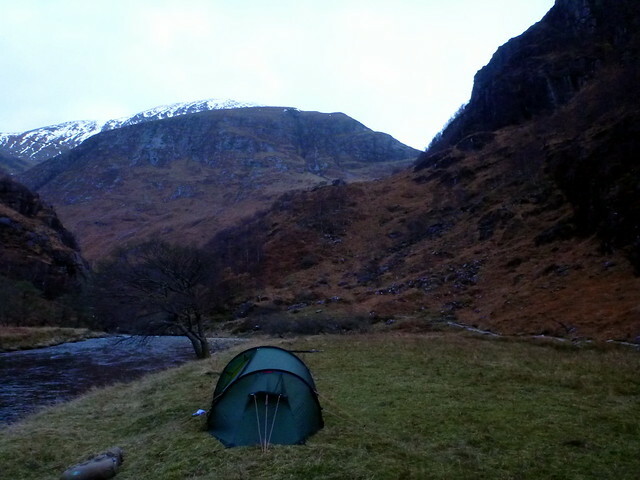 Had to make the trip from the car park to our camp-spot by the light of headtorches, not even 5pm yet. 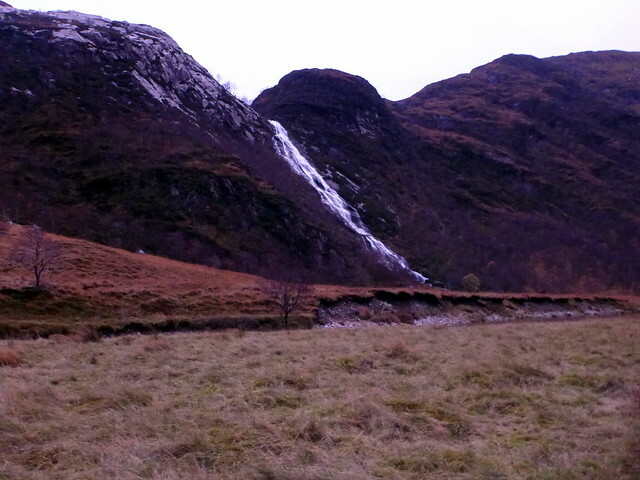 Below to our right, the Water of Nevis roared and thundered away, its white spume visible despite the twighlight. Pitched in rather more wind than I expected and hunkered down for the night. We were both still feeling pretty wretched from our colds that have been lingering for the last couple of weeks, so there was much coughing and spluttering. About 8pm the tent was lit, as if someone had switched on an overhead fluorescent tube, by the light from a full moon. Too cold and miserable to go out and investigate the views however. Everything takes longer in the cold. 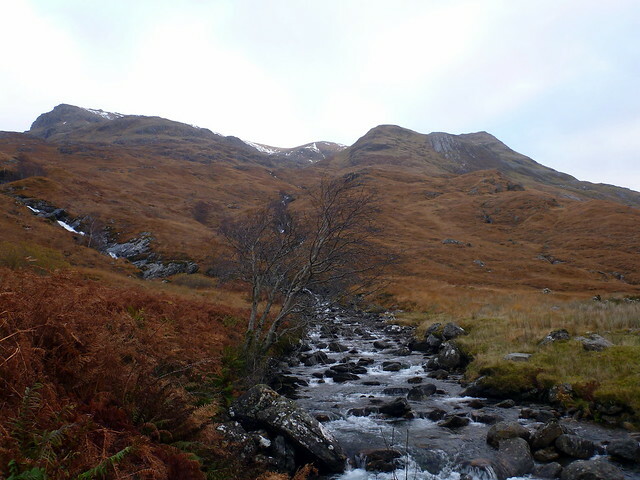 Getting out of the warm sleeping bag, getting dressed, cleaning the porridge pot in freezing river water (thanks, Ally) – it all takes more time. Despite getting up at 6.45 it was after 8.30 by the time we’d got the tent disassembled and back to the car, with rucksacks packed for the day ahead. 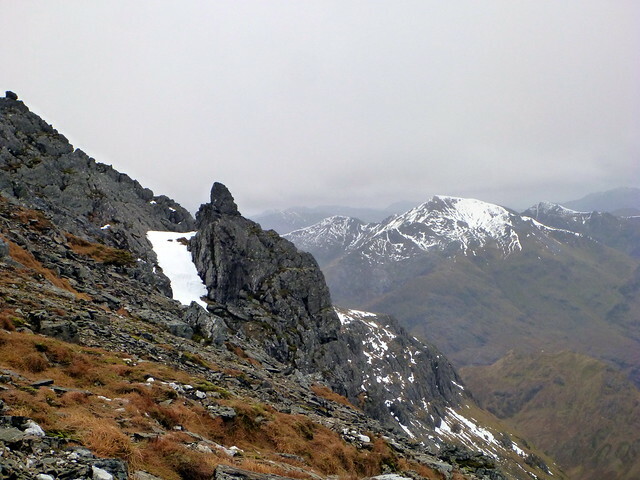 We met a woman who was going to climb Sgurr Choinnich Mor from here – a nice idea. 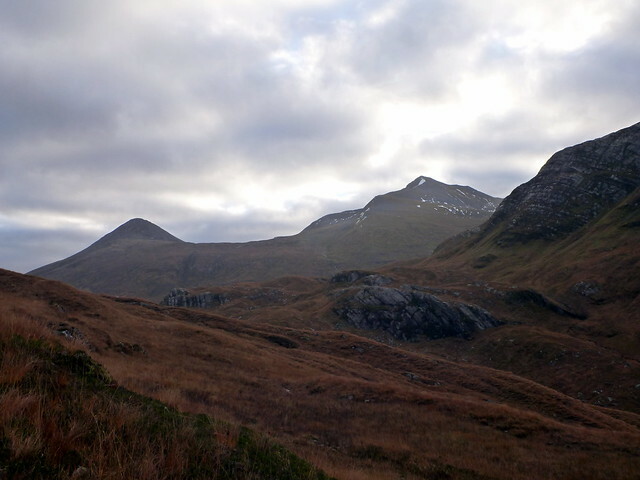 I knew our walk would be quite lengthy – Ceasar had taken 8 hours last weekend and he walks faster than I do, so I’d hoped to be on the hills by 8 – didn’t manage to get back there til 9. 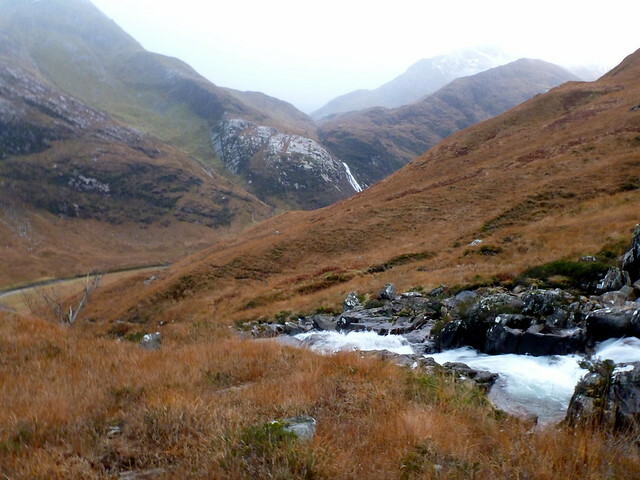 Another worry was Sick Kid’s knee – the injury from yesterday had taken its toll and she was clearly struggling along the track to Steall Meadows. I wondered if she’d manage what I assumed would be a steep up and down. She is a stubborn creature and pressed on regardless, but with considerable discomfort, manifest in an unusual lack of levity. She knew that the option was to spend 8 hours sitting in the car waiting for me, I guess . 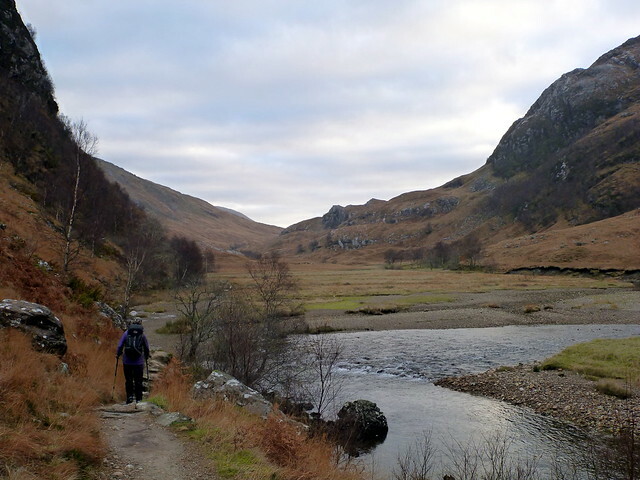 The initial section passes An Steall falls and the Mountaineering Hut with its steel wire bridge we remembered fondly from doing the Ring of Steall. The meadows open out further as you go around the corner at the falls and approach the ruins. The grasses had changed from summer green to autumn rusty brown. 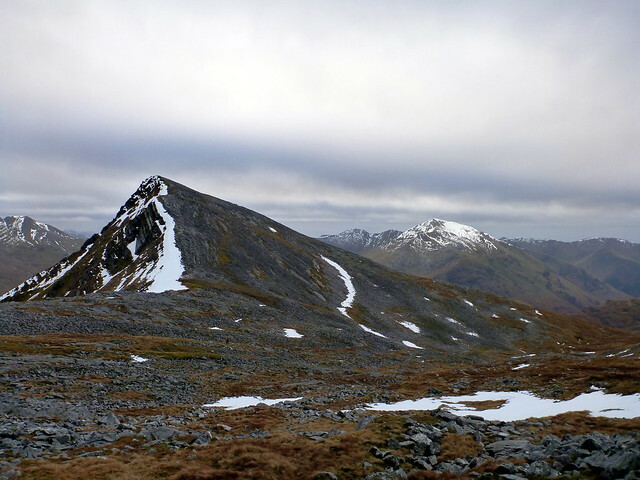 Sgurr Choinnich Beag and Mor were ahead of us, which the bigger hill still looking shapely from this angle. 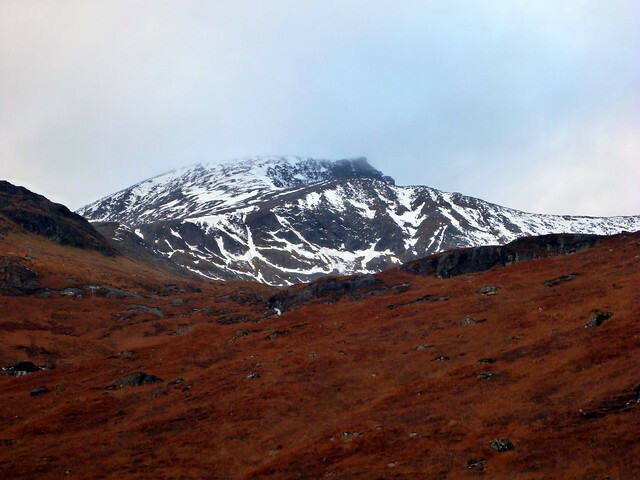 To our left, the Ben loomed, with zebra stripes of snow on the iron grey flanks the only vestiges of last weekend’s snowy blanket. 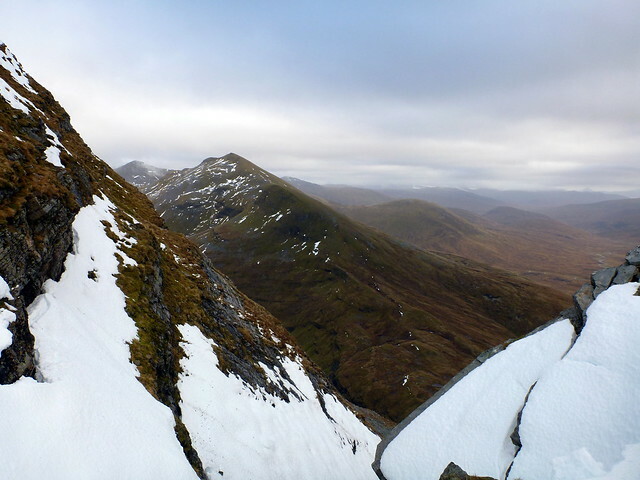 Over the footbridge and into sometimes trackless heather and bog up the shoulder of Sgurr a Bhuic – steep section between 600 and 800m proving particularly testing for Ally’s knee and had us both coughing like a pair of Victorian consumptives. 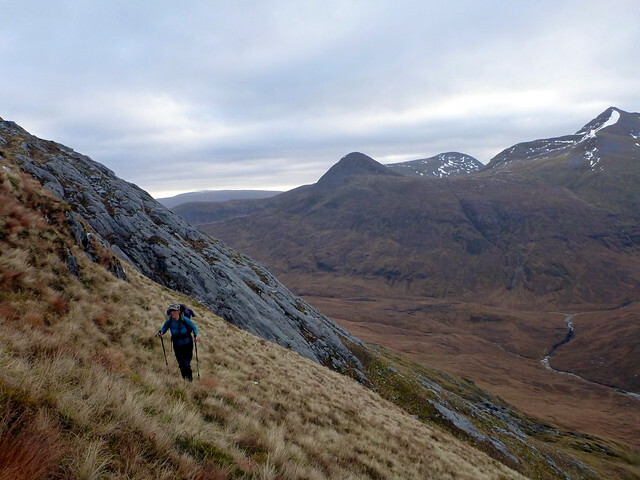 Up onto a flat section to take breath, and take in some good views back to the Ring of Steall and the Ben, then heading round the north side of Sgurr a Bhuic through scree rather than ascend the top (shame!). 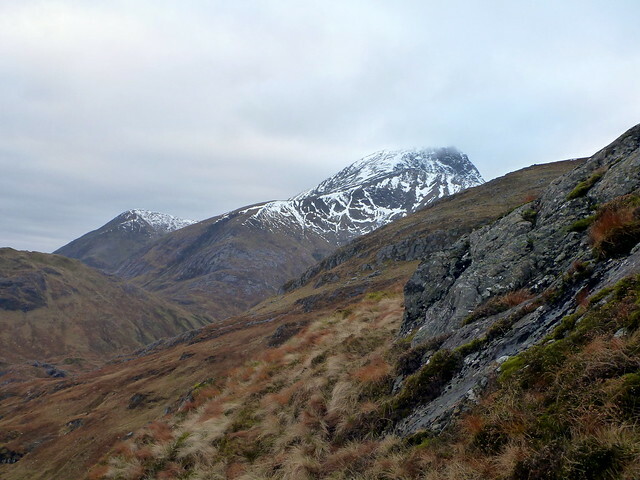 Onwards, to the pointy fin of Stob Coire Bhealaich with views SE to the neighbouring Mamores – Binnien Mor having shed virtually all her snow since we were up there last Saturday.. 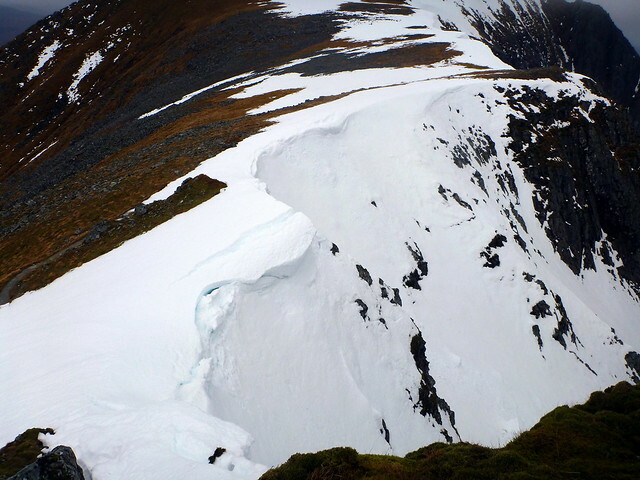 Some of the cliff faces below us were still plastered with thick plates of snow, and most of the cornices were in perilous state. 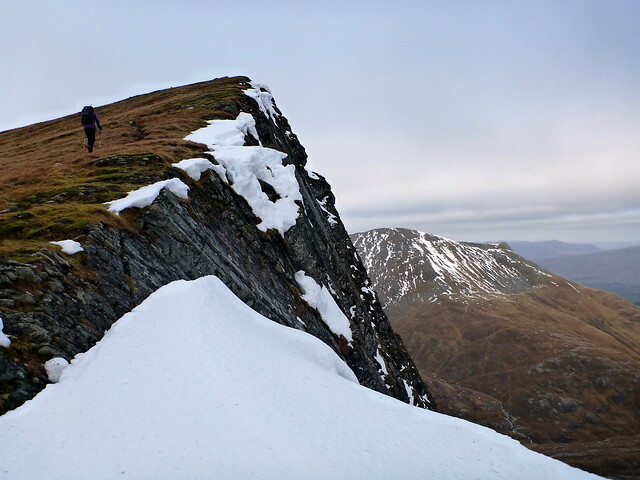 Heading for the top of Aonach Beag itself, there’s a clear path that heads off to the left, appearing to contour the peak – don’t know where it ends up, but we took the fainter path following the edge (not too closely!) 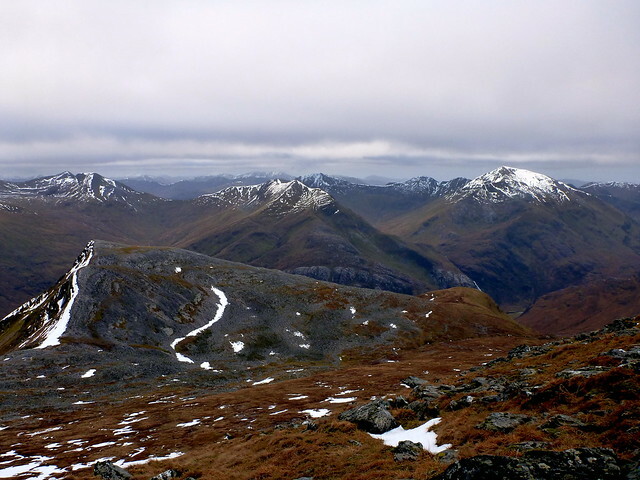 with views down into An Aghaidh Gharbh. 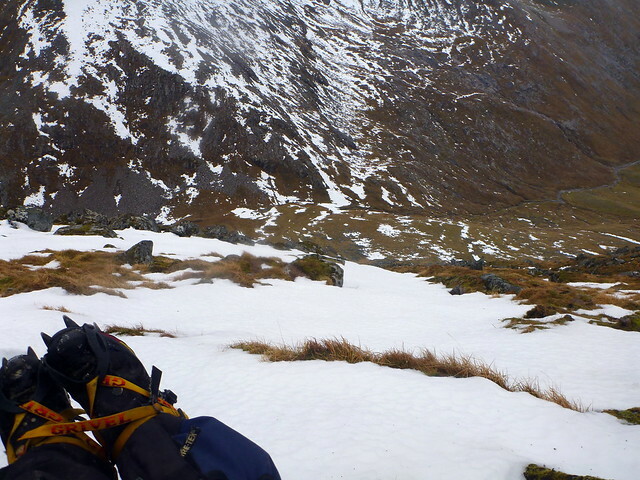 Crampons were on for the last 75m as the snow was firm and frosty. 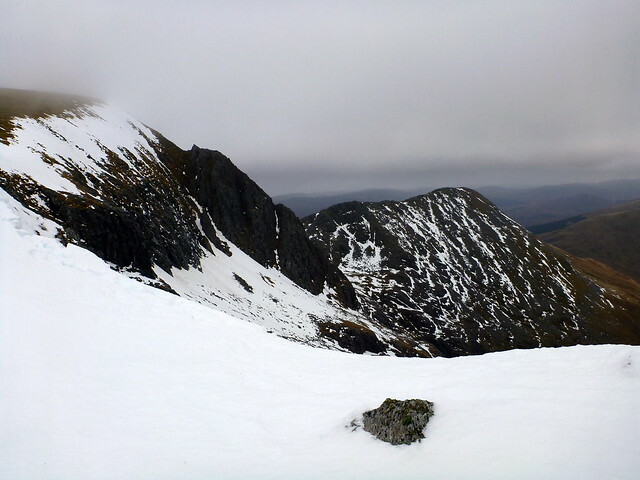 Spying the cairn on a field of white, we cautiously headed over – mindful of the time Hamish Brown almost led his party of schoolkids over the edge when the cairn was covered in snow and the only identifying feature was orange peel around the summit. No peel today. 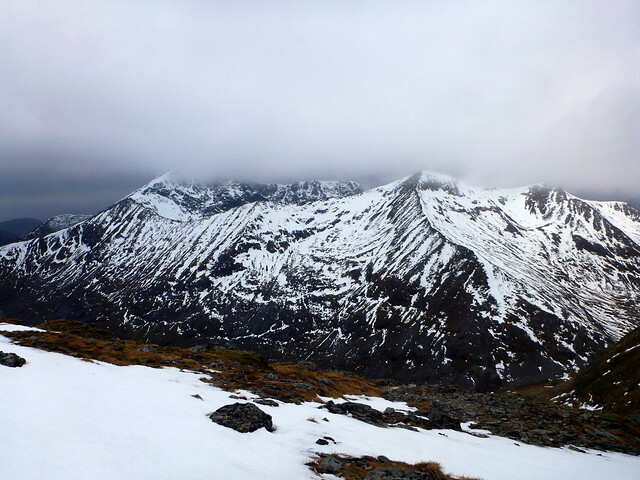 We headed north a short way before finding some rocky shelter to eat some food – in the process I managed to stand on my compass with my crampons, leaving what looked like mini-aircraft wreckage in the snow. 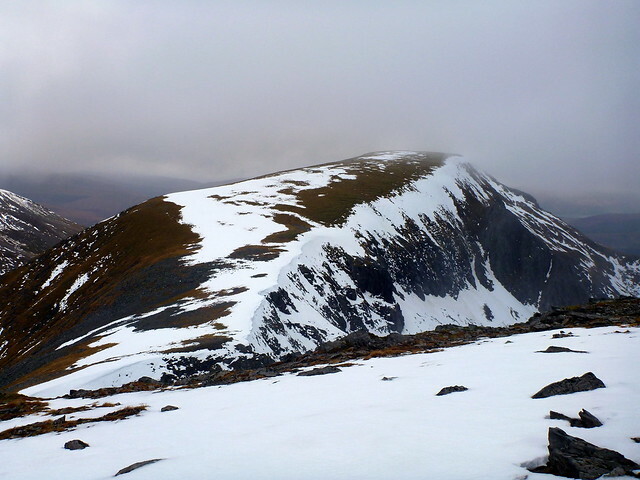 From here we could see over to the summit of Aonach Mor ahead and to Carn Mor Dearg on our left, displaying the full length of the Arete. 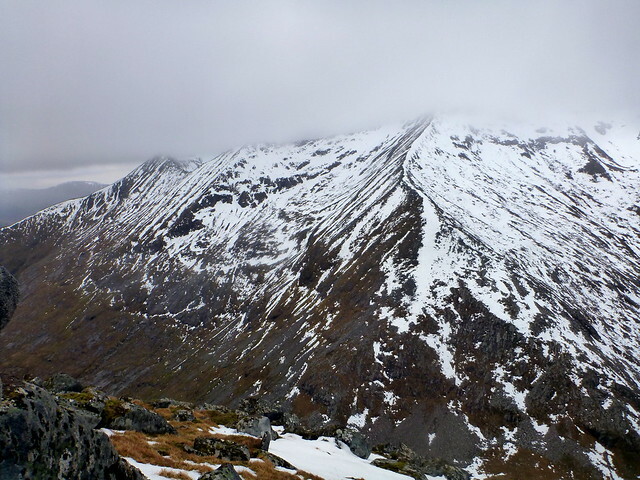 That mountain looked like it had been decorated very generously with icing sugar. 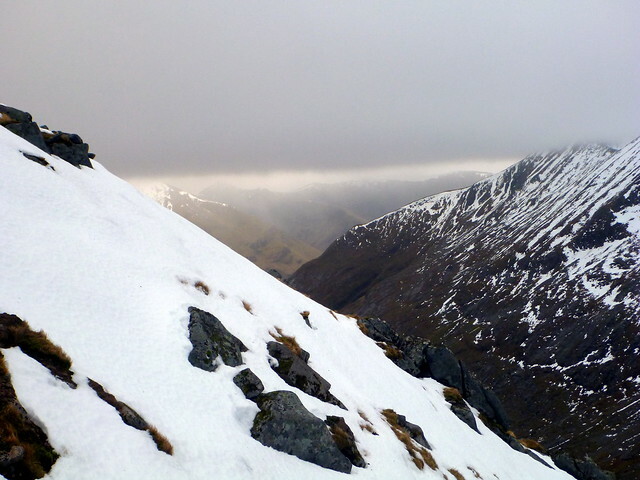 We were joined by another walker who’d been following us, and shortly by a couple who had come from Aonach Mor. Busy hill this! 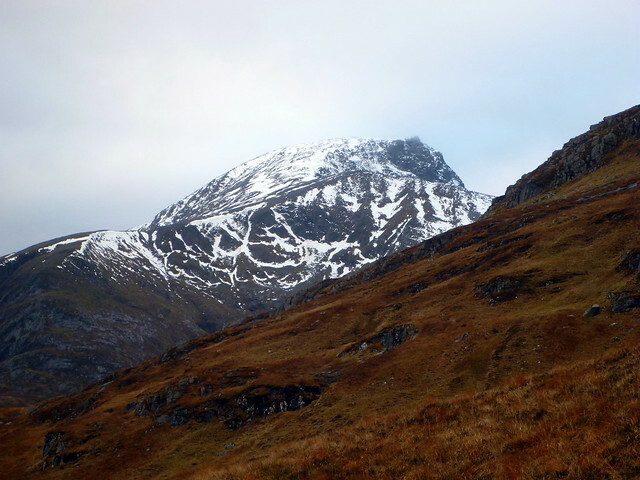 The walk over to Mor was straightforward, as long as one avoided the corniced indentations. 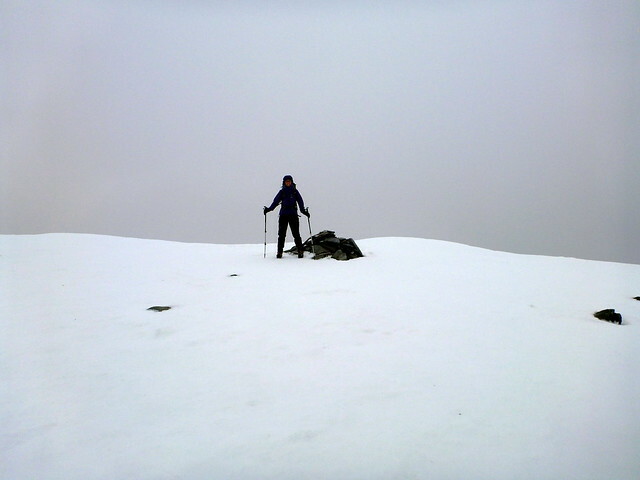 Quick pose at the top as my target was achieved then off to find the descent route. 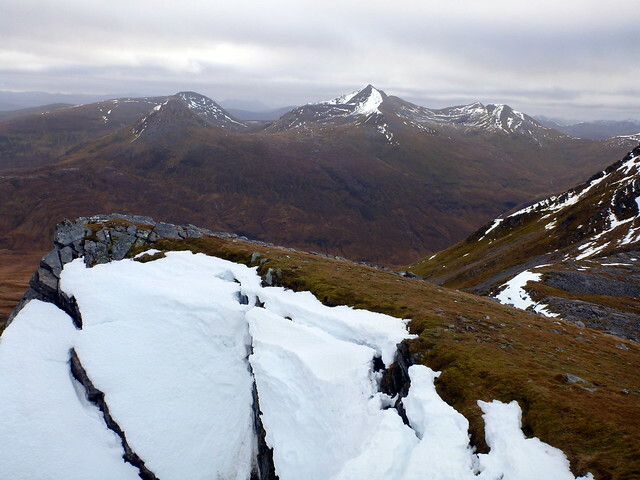 This took us down into Coire Guibhsachen but the path wound steeply down, disappearing beneath hard and icy snow, the uncovered rocks also covered with a layer of ice. I got a bit worried here for the state of my companion’s knees having to make this kind of descent. So, unsurprisingly, did she. 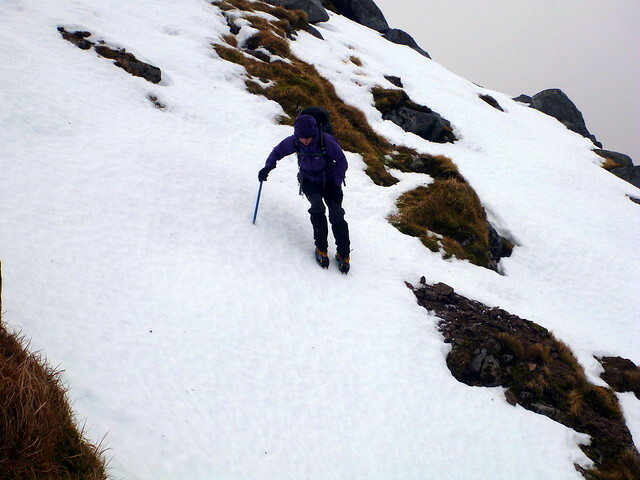 Crampons back on and axes out, we rather gingerly began to descend a snow chute where the path disappeared. Noting Ally’s struggles I thought it might be easier to descend some of the way on a grassy stripe - this involved some step cutting over the steep snow of the chute, but after dropping a little way it was clear that we’d have to go back over the chute as we were heading for a rocky drop on our current path. 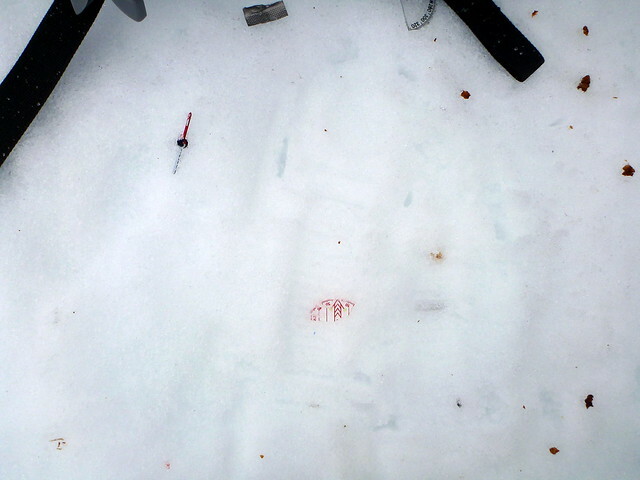 This achieved, it was a case of taking things slow and careful until we got more or less under the snow cover. This was first met with some relief, until I mentioned that we were still at 916m elevation – despite the feeling that we’d been descending for a while. 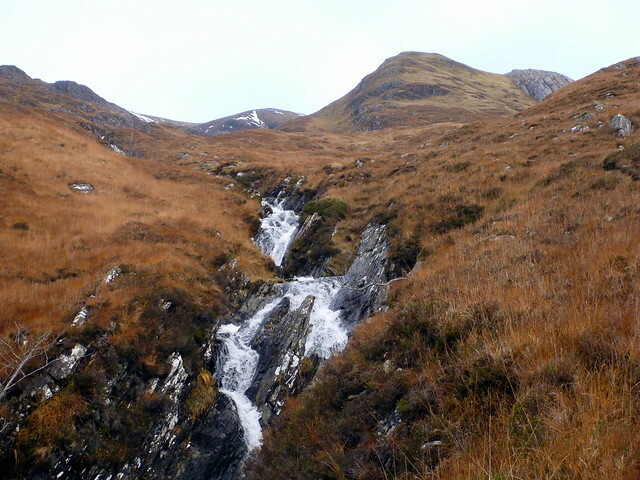 The remainder of the return follows along Allt Coire Guichsachan and passed relatively uneventfully apart from one slip in peaty marsh where I fell onto my back and ended up with a boggy, soggy bum and minor concussion. 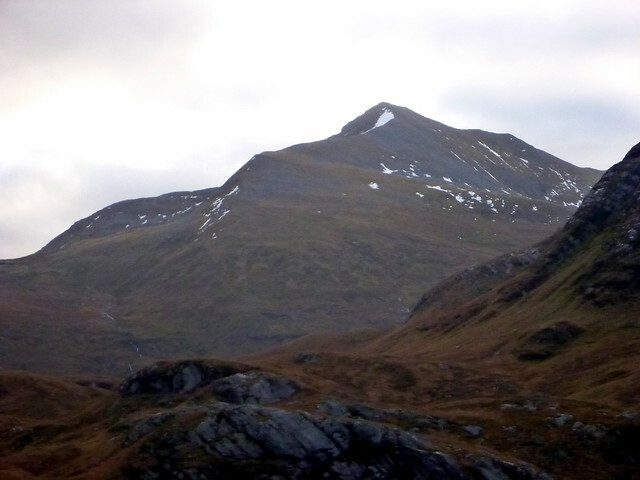 The rounded grassy hump of Meall Cumhann provided a spot to aim for. The weather was threatening rain, but in fact stayed dry til we got back to the car. 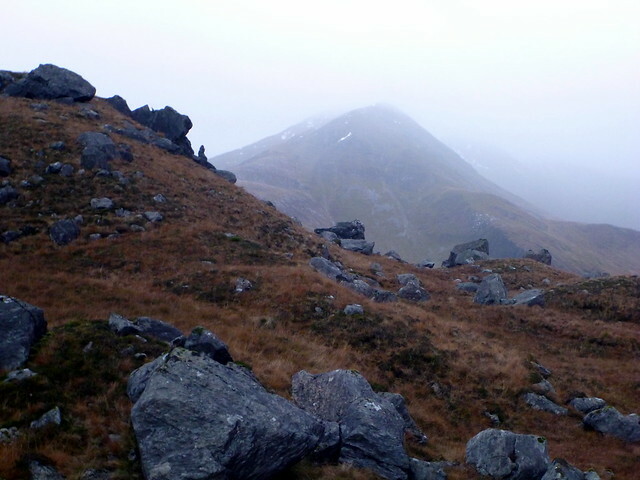 Mists swirled round the top of Am Bodach and Sgurr a Bhuic up to our left. 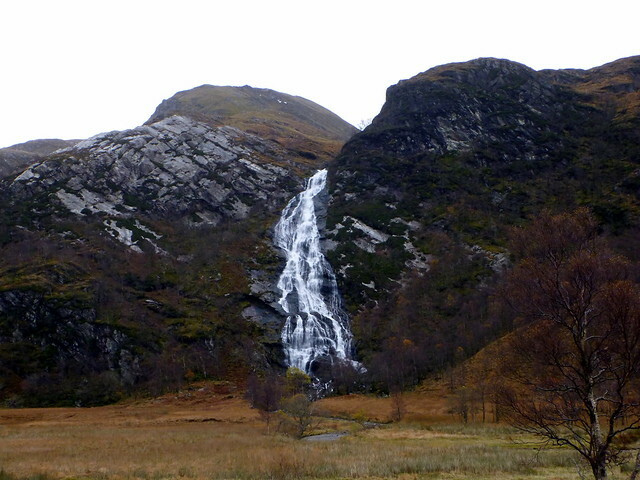 Waters whorled and whooshed in the stream beds with numerous falls. 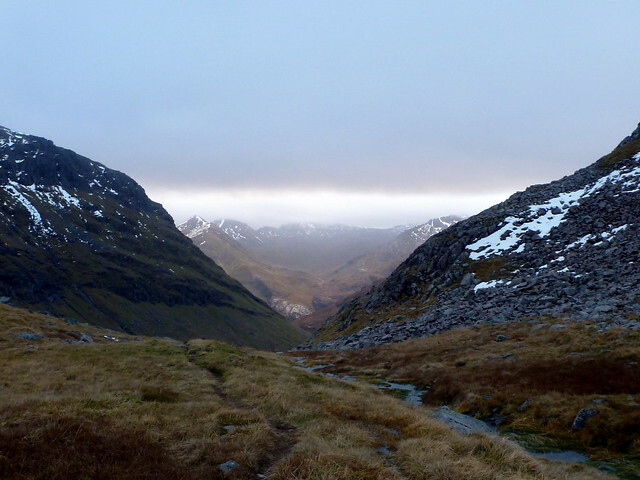 With some relief we regained the track at Steall ruins as the light was fading and managed to return without recourse to headtorches. 8 hours and 3 minutes – that seemed not bad for the state of her knees. So – target for the year achieved – what ever will I find to do now? Nice report & great photo's Al. Where's all last weekend's snow gone? 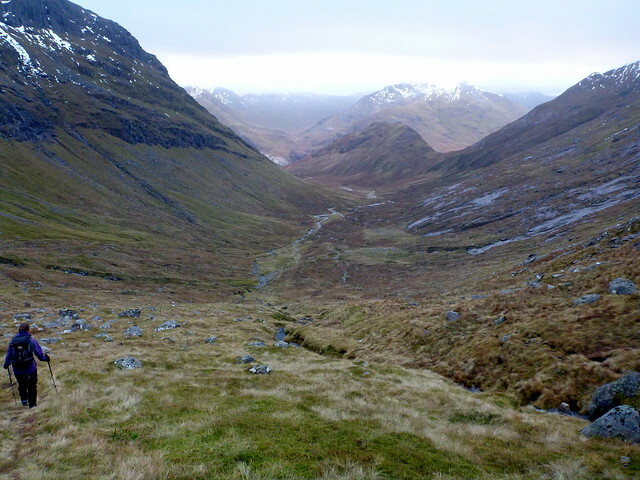 It's certainly the better route to Aonachs Beag & Mor (in my opinion),Glen Nevis is a joy to walk through & the views to the east ascending Aonach Beag are stunning,you certainly get a feeling of height. 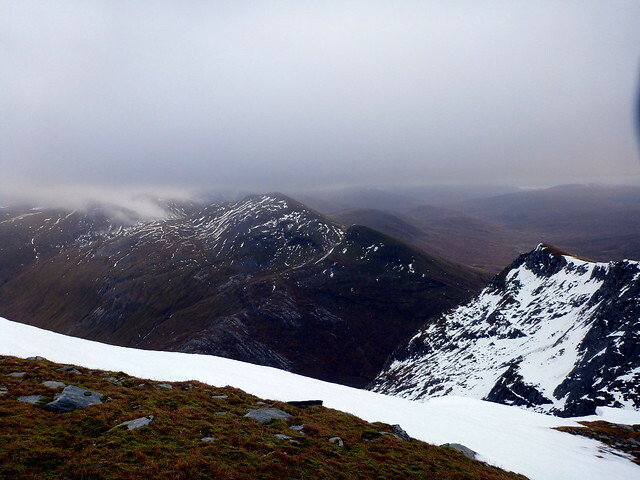 As for that descent to Bealach Giubhsachan,the less said about that the better! Hope the knees aren't too sore today. Collaciotach wrote: Good stuff Alasdair . Aha - glad I didn't take that after all!